The white-belted ruffed lemur is the third-largest of the lemur family and the largest of our lemurs here at Discover Madagascar. We're home to a male and female, Hebus and Ihosy. In 2015 Redrow Homes kindly built their new home in Discover Madagascar. This lemur has a complex social structure and is known for its loud, raucous calls. They also live in female-dominated groups. In captivity, they can live up to 36 years. Although females usually give birth to twins, females do not always reproduce successfully every year. You can get up close to our lemur family in their walk-through enclosure in Discover Madagascar from 10.30am – 3.30pm. These lemurs are frugivorous, with a diet consisting mainly of ripe fruit in the wild, although nectar, flowers, leaves and some seeds are eaten as well. Although it appears that only a small number of tree species are exploited for their fruit. Larger communities often split into smaller core-groups during times of the year when food is scarce which enhances foraging opportunities for each individual lemur. Found in Madagascar, white-belted ruffed lemurs prefer lowland rainforest. They spend most of their time in the high canopy of the seasonal rainforests on the eastern side of the island. These species of lemur is listed as Critically Endangered. It is suspected to have sadly undergone a population decline of 80% over a period of 21 years. This is primarily due to continuing decline in extent and quality of habitat from deforestation and commercial agriculture, logging and mining and hunting. 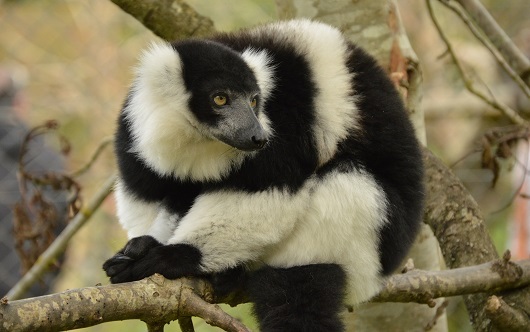 You can learn more about the white-belted ruffed lemurs' conservation status on the IUCN Red List of Threatened Species website.